While most Western countries are pre-occupied with their internal problems, our enemies prepare to strike with "One closed Fist". Russia and China are deepening their political, economic and military unity , preparing to take advantage of looming Western economic and social chaos. From the Communist Party of China website. 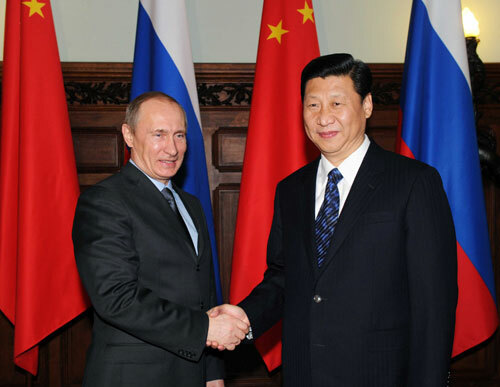 Chinese Vice President Xi Jinping (R) meets with Russian Prime Minister Vladimir Putin in Moscow, capital of Russia, March 23, 2010. At a meeting with Prime Minister Vladimir Putin, Xi conveyed sincere greetings from Chinese President Hu Jintao and Premier Wen Jiabao to the Russian leader. The Sino-Russian relations have always been a priority of China's foreign policy. To boost a sound and stable development of the Sino-Russian relations of strategic cooperation and partnership have been an established guideline of the Communist Party of China (CPC) and the Chinese government, Xi said. China stands ready to step up mutual support on issues concerning both sides' core and strategic interests, exploit complementary advantages, jointly promote a multi-polar world and the democratization of international relations and elevate bilateral ties to a new stage, the Chinese vice-president said. Putin, who appreciated and also extended his greetings to Hu and Wen, said he totally agreed with Xi on his positions concerning enhancing the ties between the two countries and their ruling parties. Russia is willing to intensify strategic coordination with China and push forward bilateral relations, Putin said. In plain English, promote a multi-polar world and the democratization of international relations and elevate bilateral ties to a new stage, means the destruction of US military and economic dominance and the creation of a new order dominated by Russia and China. That, in really, really plain English, means world slavery.